Battlefront is getting into the starter set game with ‘Open Fire!’ This seems to be a intro box with all the gear folks need to play the game. In addition to miniatures, (I assume) dice, and hobby book, this box includes a new wave of plastic miniatures. Para troopers supported by British Sherman tanks face off against the Wermacht infantry, guns, and Stug tanks. There also appears to be a V-2 rocket launcher! I am guessing that this is something of an objective, or mission plot point. I like the idea of these starter sets. 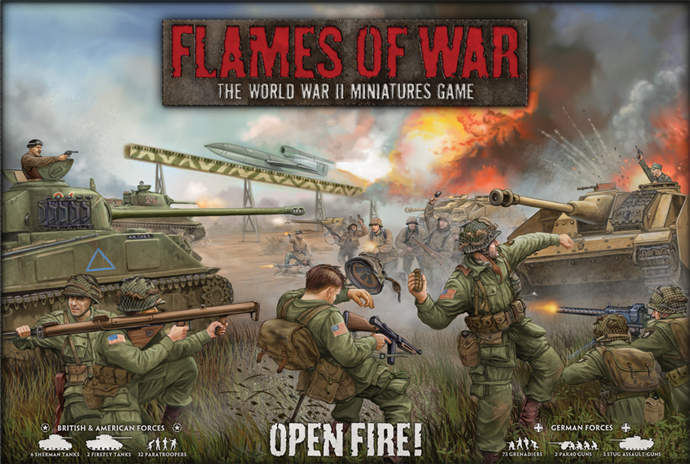 They really give players a way to get into the game, and with Flames of War, that may seem like a daunting task. The continued evolution of BF’s plastics is exciting as well. These are some of the most appealing plastic infantry that I have seen to date, and are much cleaner, and effective than some of Battle Front’s metal line. I’m a bigtime FoW fan-boy, so I am excited about this release, and I can’t wait to see where it leads! Actually it’s a V-1 launcher, but since it’s just a scenery piece (albeit a pretty cool one) it doesn’t really matter. The only bad part about this set is as an established player of German grenadiers I already have all the StuGs and PaK40s that I need. For somebody who is just starting out though, I think it’s probably going to be a good entry point to the game.